The unemployment rate ticked higher to 4 percent, a level where it had last been in June, a likely effect of the shutdown, according to the department. However, officials said federal workers generally were counted as employed during the period because they received pay during the survey week of Jan. 12. On balance, federal government employment actually rose by 1,000. Economists surveyed by Dow Jones had expected payrolls to rise by 170,000 and the unemployment rate to hold steady at 3.9 percent. Simply put, the doom and gloom that was forecast by Democrats didn’t materialize. Instead, Larry Kudlow’s prediction that the economy would remain strong proved true. Our economy suffered an $11 billion loss in the shutdown. Individual costs are harder to see. Who knows how many fed workers missed a doctor’s appointment, fell behind on payments. Now Sen. Schumer will be able to dine on a major helping of crow at next Tuesday’s SOTU Address. Earlier this week, Sen. Schumer told President Trump to stay out of the negotiations and leave the governing to the Senate. After this jobs report, which blew away the expectations by 140,000 jobs (304,000 actual vs. 165,000 forecast), Sen. Schumer should stick to what he does best — whining while wearing bad-fitting glasses. The January jobs report holds some encouraging news, but it belies the lasting financial damage that the Trump Shutdown has inflicted on hundreds of thousands of Americans across the nation. Federal workers, many of them veterans, saw their financial security shaken, their credit ratings harmed, and their lives upended by the longest shutdown in history. And now, with families still hurting, President Trump refuses to take a second senseless shutdown off the table. Meanwhile, House Republicans overwhelmingly voted against a pay raise for federal civilian workers, refusing to respect the perseverance and patriotism of the men and women who were just furloughed or forced to work without pay. This consistently callous GOP attitude disrespects workers, dishonors our values and damages our economy. House Democrats are working For The People, moving forward with our bold agenda to lower health costs, raise workers’ wages, and restore integrity to government. We must keep government open, and keep working to deliver an economy that works for every American, not just the wealthy and well-connected few. What financial damage? I don’t see it. Next, getting told that Democrats “are working For The People” is a little like being told that arsonists are assisting firefighters. There just isn’t a ring of truth to it. Finally, saying that the “GOP attitude” is damaging the economy is BS. The economy isn’t damaged. Simply put, Democrats hate President Trump more than they like this country. Democrats don’t care if our nation is overrun with illegal aliens. Democrats don’t care if our border is secure. What Democrats want most of all is to politically demolish President Trump. Obviously, the plan is to make Nancy Pelosi, Chuck Schumer and freshman House Democrats look unreasonable. That isn’t difficult since Democrats are totally unreasonable. Say goodbye to that Speaker’s gavel, Nancy. Many of those freshmen that were elected in 2018 won’t be returning thanks to your intransigence. Now that we know that Ms. Pelosi isn’t returning to the negotiating table, it’s time to go nuclear. The thing Republicans need to understand is that Democrats aren’t interested in bipartisanship. They’re interested in demolishing President Trump’s presidency. Period. Democrats in the House and Senate have left me no alternatives. While more caravans head toward the border, Democrats and their allies in the Agenda Media insist that this is a “manufactured crisis.” How dare they say that. I dare them to tell that to the Angel families that I’ve met, the Angel families that tried meeting with Speaker Pelosi but were told she wasn’t there. Democrats insist that they’re for border security. That’s a lie. If they’re for true border security, they wouldn’t have voted to filibuster the bill just presented for Senate consideration. They wouldn’t have issued a letter saying that it was dead on arrival in the House. In both instances, Democrats said that they’d only allow a vote if the government opened first. When I asked Speaker Pelosi if she’d fund the wall if I re-opened the government, she said “No.” I’ve been willing to negotiate throughout. Unfortunately, Democrats have rejected my offers to even meet. I can’t negotiate with myself. Therefore, I’m left with just one option. Today, I’m invoking the Emergencies Act to protect the United States from mass illegal immigration, drug trafficking and human trafficking. While Democrats insist that I’m manufacturing this crisis, people from California to Texas to Staten Island have felt the pain of these criminals. If that doesn’t constitute a national emergency, nothing does. My highest priority as president is to protect human lives. Because Democrats won’t join with me in protecting American lives, I’m taking action to protect those lives. Let’s be blunt about something. The Democrats’ image crisis just got worse this weekend. It started with Sen. Schumer and Speaker Pelosi thought that it was a good idea to offer a rebuttal to President Trump’s Oval Office speech on why the nation needs a border barrier. 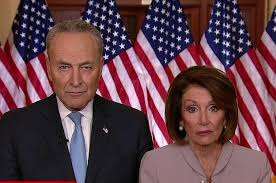 If asked how I’d phrase how they looked that night, I’m betting that that first thing that’d pop into my mind would be that Chuck and Nancy looked ‘almost lifelike’. The next day, President Trump invited the House and Senate leadership to the White House. Democrats insisted that President Trump re-open government immediately. President Trump asked whether Speaker Pelosi would fund his wall if he re-opened the government. She emphatically said she wouldn’t, at which point President Trump said that the Democrats were wasting his time before leaving the Situation Room. The Democrats were winning the fight until Chuck and Nancy turned themselves into a skit for SNL. Then they insisted that they wouldn’t negotiate in good faith. At this point, public polling still shows them winning this fight. It won’t show that a month from now. That’s because 30 Democrats decided to accept lobbyists’ invitation to fly down to Puerto Rico. President Trump and his conservative allies are slamming some Democrats for traveling to Puerto Rico over the weekend as the longest government shutdown in U.S. history continues to drag on. A contingent of more than 30 Democratic lawmakers, the largest delegation to visit Puerto Rico, traveled to the island to discuss post-Hurricane Maria recovery efforts, unpopular austerity measures and federal investment to the territory with local officials. The delegation is also there to participate in fundraising events hosted by Bold PAC, a political committee that serves as the Congressional Hispanic Caucus’ fundraising arm. Presidential hopeful and former Housing and Urban Development (HUD) secretary Julián Castro also traveled to the island after launching his White House bid in San Antonio Saturday. While President Trump waits in the White House to negotiate in good faith, Democrats insist on not taking this nation’s security seriously. He’s made Democrats an offer. He’s even offered Democrats several immigration items that they’ve recently called for. At some point in the not-so-distant future, Democrats will be seen as unreasonable. That’s when they polling will flip. Trump and his allies need to recognize the reality that the government needs to reopen ASAP, that a wasteful, unnecessary and unpopular wall will never happen, and that they need to begin serious negotiations with the House of Representatives. Contact your representatives (202-224-3121) and tell them it’s time to end the shutdown. As much as we need a reality check about the border, we must also not miss this moment to finally protect our DREAMers and TPS communities once and for all. President Trump is right. This is just common sense. Democrats should be ashamed of themselves. Not protecting Americans is the personification of being un-American. Period. The Democrats are fighting a losing fight because they’re fighting for re-opening the government while President Trump fights for keeping people safe. That’s a fight any politician will win 99% of the time. People understand that walls work in providing security. Meanwhile, people that aren’t employed by the government generally don’t care if the government isn’t open because they don’t use government on a daily basis. People definitely care whether the government protects them, though. That’s an expectation people have of their government. If the USDA or the EPA isn’t open, people will get over it because they don’t use those departments that often. While people don’t use ICE or the CBP each day, people rely on them to keep them safe each day. Democrats dug this hole. Let’s see how much damage they do to themselves before this shutdown ends. Last night, Speaker Pelosi and Sen. Schumer did their best American Gothic impersonation. This afternoon, Speaker Pelosi did her best Cruella Deville impression. At a meeting in the White House, Democrats urged President Trump to open the government. Then Democrats said that they’d negotiate border security provisions. President Trump then asked Speaker Pelosi if he quickly re-opened the government if she’d agree to funding President Trump’s wall. Immediately, Pelosi said she wouldn’t. The president, in a tweet, called the meeting “a total waste of time” and appeared to confirm that he left after Pelosi’s answer. “I asked what is going to happen in 30 days if I quickly open things up, are you going to approve Border Security which includes a Wall or Steel Barrier? Nancy said, NO. I said bye-bye, nothing else works!” Trump tweeted. If Pelosi thinks that negotiations are about Democrats getting everything they want and Republicans getting nothing, then President Trump did exactly the right thing. It’s a waste of President Trump’s time. It’s one thing to be miles apart during negotiations. It’s quite another to refuse to negotiate. For Democrats to go from $0 for a border barrier to $0 for a border barrier today isn’t negotiating. That’s astonishing. We’re 3 weeks into this shutdown and Democrats still haven’t made a counter-offer. That’s the definition of negotiating in bad faith. Don’t be surprised if President Trump characterizes Democrats as the obstructionist party. Further, don’t be surprised if that characterization sticks.